Often the power supply of an amplifier is underestimated. In mentioning this, I mean that the power supply is much more important regarding the overall sound than often thought, unfortunately. Can you think of a better capacitor than paper-in-oil? What are the pro's? Well, a long lifetime is one. Think of old "tube radio's" that play on for almost forever without hum.. Ten to one that paper-in-oils are used. Also the "typical" warm sound may be two. I think that this is due to their relative slow character.. Why slow? Their behavior in decoupling is good, very good (up to several hundreds in Khz, often better), so this can not be the reason. I think that it has something to do with the oil used. Have you ever opened up a paper-in-oil cap? The oil used is "syrupy" and I think that this "muffles" the sound, giving that warm character. 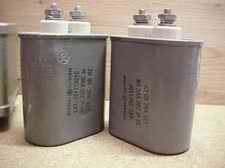 Be careful when opening up a "pio"; In older types capacitors the oil used can be toxic! The more recent types, like from Angela.com, are not toxic or polluting. A trick to prevent an amplifier from sounding "slow" and/or too "warm", is to keep the cap's values as low as possible - just enough to get rid of the ripple. This "slowness" is often not noticed before hearing a capacitor that has the speed of an electrolytic without the "harshness"! Don't understand me wrong: the paper-in-oil is a very good capacitor which I often use when designing power supplies, but there's a better one.. The BlackGate WKZ is a good example. These electrolytics are made of a special composite (carbon etc.) and are deadened using tar which is placed between electrolytic and aluminum casing. These caps are expensive but way better than normal electrolytes and even paper-in-oils. The lifetime should be better than ordinary electrolytic's, which somewhat justifies the price.. The beauty of using a WKZ is that the power supply becomes really silent. Often we use as low as possible values paper-in-oils to keep up "speed and presence" (4, 8 or 12mF), this will result in a "near silent" supply. Values with WKZ start at 47mF... A disadvantage of the WKZ can be its voltage rating; 500Volts, with 550Volts surge.. These are the ratings a paper-in-oil starts at.. That's a reason why in real high voltage supplies almost solely paper-in-oils are used. My ideal high voltage supply (up to 500Volts) in a power-amp would be: 2mF pio - 10He choke - 47mF WKZ - 10He choke - 47mF WKZ. The paper-in-oil to pleasen the rectifier and to just evade a choke-input character. 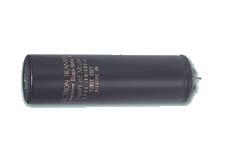 A powertube biased at 200mA will be "dead silent" when using this power supply! What if the firm who produces WKZ claims that there is an even better capacitor? Well, they sure have my attention! The types NH, N & Nx are capacitor with no polarity: Non-polars. Don't mix them up with bi-polars! Non-polars have an indication to be able to mount them all likewise, a so called "fake-minus". Type NH indicates high voltage rating (up to 350Volts), N-type is lower voltage in which type Nx is an improved version. These are (physical) relative small caps, as well in value (as low as 0.47mF!). Type NH is a good capacitor when used in power supplies, WKZ is slightly better. This is also when using types N and Nx as kathode-bypass etc: good but not better then BlackGate FK or Elna Cerafine. Can this be done better? This is where the super e-cap comes in: Mount two non-polars parallel to each other, each in opposite direction (fake-minus to plus and vv., see picture). 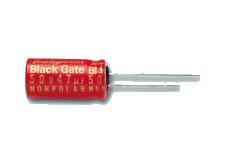 BlackGate claims that the super e-cap has no inductive resonance and a ESR (equivalent series resistance) of almost zero. In accomplishing this, they take away (almost) all negative aspects of an electrolytic! One con stays: a low voltage rating (up to 350Volts), which limits the use in power supplies. 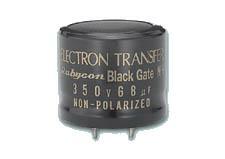 I use them in my pre-amp and power-amp in cathode-bypass circuits. Is super E-cap really better? To be shortly: Yes! The super e-cap outperforms any known capacitor in my system! It has the sound of thè best cap: No cap! It is fast and open sounding as I have never heard before in an amplifier, and all this preserving the tonal balance. This will remain, no matter how often a super e-cap is applied.. A big amount of the quality of my pre-amp is due to the use of super e-cap in the power supply and as cathode bypass! Also the Nono-Dac benefits from the use: I even use a coupling capacitor of almost 10mF (2 x 4.7mF super e-cap) without any sibilant highs or "grainy" sound! One thing though: These non-polars take an awfully long time to break-in: up to a couple of weeks playing each day a few hours.. First you'll "loose" low-end response and when it reappears mid and midhighs will varnish. Eventually the high quality of super e-cap will appear and sound will be better then ever. After this break-in period things will only get better. So be warned: Do not judge until after a few weeks! Be patient and you will be rewarded! As power supply capacitors the super e-cap will be almost as expensive as the WKZ: one NH won't cost the world, but you'll need 4 of them to create 2 capacities.. In cathode bypass circuits costs will be reasonable, except for 50Volt plus circuits..
ps. This performs (much) better than "an Elna rebuilt , don't even bother taking of the plastic anymore..! Too much super e-cap: Overkill? In general a component is not to be used too much to prevent "signature" the sound. Does this also apply for the super e-cap? I currently use the super e-cap in the "Nono-Dac", my pre-amp "Mystique" and recently in the cathode circuits of the power-amp. This results time after time in greater speed ánd neutrality without affecting tonal balance. In my opinion super e-cap can be succeeding used without "signature"! Also remarkable ánd valuable is that each time super e-cap is used, circuits get literally more silent! Not only "black" is more "black", but also any residual ripple will be filtered out. Of course using (mostly) twice as much mF's is the cause, but still!